*Well, well, well, look who went and did it. 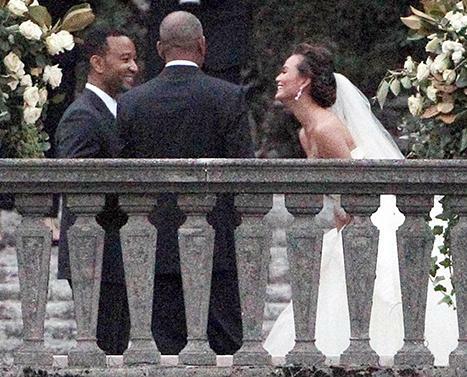 John Legend and Chrissy Teigen are finally Mr. and Mrs.! Mr. and Mrs. Legend were feted by family and friends, including Kanye West and Stevie Wonder. The “Isn’t She Lovely” singer also performed with Legend as a special treat. Actress and model Brooklyn Decker took on the role as maid of honor and Biz Markie helped DJ the celebration. Teigen’s other close friend and bridesmaid, sports journalist Erin Andrews, was unfortunately unable to take off work to attend. Get the full story at US Weekly. what do u mean they are legal? are u trying to say they got married for the wrong reasons?! whyyyyy im not surprised!!!!! !